This Biological Sciences unit explores how living things grow and change. Animal offspring (including humans) are compared with their parents and plants are grown from seed in order to observe change over a period of weeks. 1 How Do Living Things Change? 3 A-Planting We Will Go! It consists of 7 lessons of approximately 60 minutes duration. Teachers are encouraged to collect samples of students’ work throughout the unit to add to a learning portfolio. These can also be used to assess students’ understanding of the unit objectives. To activate prior knowledge about how living things change as they grow. To develop an understanding of the procedures scientists use and to design one segment of an experiment. To plant seeds following the procedure of the scientific method. To compare observable features of adults and offspring and to identify the proper names of adults and their offspring. To demonstrate knowledge and understanding of simple life cycles. To develop an understanding of the concept of metamorphosis. To demonstrate knowledge and understanding of the stages of the human life cycle. This Science unit provides excellent opportunities for cross-curricular integration. Look for ways to meaningfully integrate the content of the unit with other learning areas e.g. Literacy, Numeracy and The Arts. 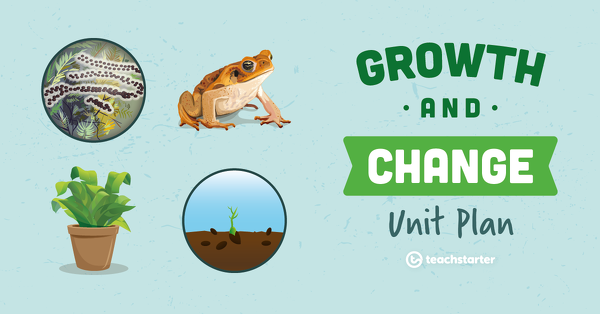 Prior to commencing the unit, develop a classroom display which focuses on living things growing and changing. Display word wall vocabulary and learning goals that the students will engage with throughout the unit to stimulate their learning. For examples of additional teaching resources to display in your classroom, browse the Growth and Change collection on the Teach Starter website. How Do Living Things Change? A 60 minute lesson in which students will activate prior knowledge about how living things change as they grow. A 60 minute lesson in which students will develop an understanding of the procedures scientists use and design one segment of an experiment. A 60 minute lesson in which students will plant seeds following the procedure of the scientific method. A 60 minute lesson in which students will compare observable features of adults and offspring and identify the proper names of adults and their offspring. A 60 minute lesson in which students will demonstrate knowledge and understanding of simple life cycles. A 60 minute lesson in which students will develop their understanding of the concept of metamorphosis. A 60 minute lesson in which students will demonstrate knowledge and understanding of the stages of the human life cycle. An assessment task in which students will demonstrate their knowledge and understanding of how living things grow and change. A fun sorting activity to help students become familiar with vocabulary related to seedlings. A 20 slide teaching presentation to use when introducing your students to the scientific method. A poster outlining five steps of the scientific method for younger students. Science Experiment – How Does Soil Affect Seed Growth? A science experiment which explores the growth and change of a seedling. A worksheet for students to brainstorm the similarities and differences between a lion cub and an adult lion. A fun sorting activity for students to identify the names of female animals, male animals and their babies. A set of dominoes to use in the classroom when investigating animals which lay eggs. A See, Think, Wonder Template is useful in encouraging students to make careful observations and interpretations. A worksheet for students to brainstorm the similarities and differences between a chick and a hen. An activity for students to use when learning about life cycles. A template to use when investigating animals, their offspring and how they grow and change. Help your students concrete their understanding of life cycles with this interactive game. An activity for students to use when learning about life stages. A fun sorting activity to help students identify the behavioural and physical changes humans experience at different life stages. A template to use when learning about human life stages. An open-ended task for students to demonstrate their understanding of how animals grow and change.